Governor Troy was born on this day, October 31, 1868 in Dungeness Washington. John Troy came to Skagway with his wife Minerva on August 19, 1897 as a correspondent for a Seattle paper and stayed in Skagway until poor health caused him to return to Washington. John returned with Minerva to Skagway in 1898 and managed a pack train taking supplies over the White Pass. His daughter Helen was born in Skagway in 1899 and daughter Dorothy was born in 1901, although it is unclear if she was born in Skagway or in Washington. The Troy family moved back to Seattle, Washington in 1907. While in Skagway, John joined the Arctic Brotherhood. He was also the city auditor, the city clerk from 1900-1901 and was the Vice President of Chamber of Commerce. He was the publisher of the Daily Morning Alaskan from 1899-1904. John moved back to Alaska in 1913 with Helen and Dorothy to be editor of the Daily Alaska Empire in Juneau. He purchased the newspaper in 1914. While visiting Seattle in 1916, John Troy married Mrs. Ethel Crocker Forgy, formerly superintendent of schools in Seward and also a licensed embalmer. 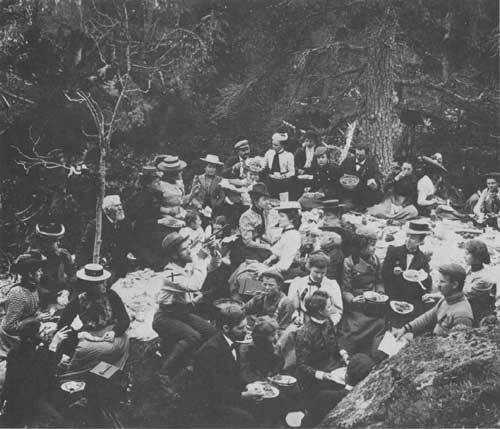 The couple continued to live in Juneau, where in addition to being the manager and editor of the Daily Alaska Empire, John Troy was also Collector of Customs for the District of Alaska from 1919 until 1922. He was active in politics and was elected Governor of Alaska from 1933-1939. He died in 1942 in Juneau and is buried in the Evergreen Cemetery. 1905 directory; 1900 census (listed as Tosy);Juneau Genweb;1909 AB book,Gold Rush participants website; Minervas papers online at Alaska Archives. Thomas McInnes was a son of Dr. T R. McInnes, a Senator, and subsequently Lieutenant-Governor of British Columbia. Tom was born at Dresden, Ontario, October 29th, 1867. He graduated in 1889 from the University of Toronto. In December 1868, he married and shortly afterwards registered as a student-at-law. He was called to the Bar, in 1893. In 1898-1900, the ever-natty McInnes was private secretary to his father, the Lieutenant-Governor of British Columbia. In 1907, he officiated as secretary of the British Columbia Salmon Fisheries Commission. McInnes died in 1951 in Vancouver, B.C. Minter page 134; Skagway Museum Record. “Joseph and Blanche Beauchamp lived at Bear Creek, 110 miles outside of Whitehorse on the Kluane Road. On February 8, 1913, Blanche gave birth to a male child. The baby was premature and lived for only a few hours. Joseph planned to bring Blanche into Whitehorse for their son’s funeral as soon as she was well enough to travel. However, complications set in and Blanche’s health deteriorated. With the nearest neighbour 20 miles away, Joseph felt he could not leave his wife to seek help. Blanche died a few days later of blood poisoning. By 1920 Joseph was back in the Skagway area and homesteaded at Burro Creek which is across the inlet from Skagway. The Camera Club enjoyed a picnic there in 1900 seen above. He lived there until his death on January 12, 1935 and is buried in the Skagway Pioneer Cemetery. Skagway 1900 and 1920 census; 1915 directory; Skagway death record; “What Lies Beneath” Whitehorse Cemetery online book. Captain Bailey was a captain for one of the White Pass & Yukon Route Steamships. Born in 1865 in Wisconsin, he died on this day, October 27, 1919 in Mayo, Yukon Territory of stomach ulcers. His body was sent to Seattle for burial. He came to Skagway in 1897 and worked as a laborer for White Pass and continued to work until his death. Sternwheelers were an ideal vessel for the Yukon River’s shallow, narrow waters. The stern mount made for a narrow vessel, and protected the paddle wheel itself from snags and sweepers. The flat bottom gull allowed for little draft, even with heavy cargoes. The paddlewheel helped grounded vessels off sandbars by reversing and washing sand away from the hull: a vessel could also approach shallow waters stern-first and dredge a channel for itself. The sternwheeler could land practically anywhere since docks were not necessary. Just after the railway reached Whitehorse in 1900, WP&YR set up a marine division called British Yukon Navigation. 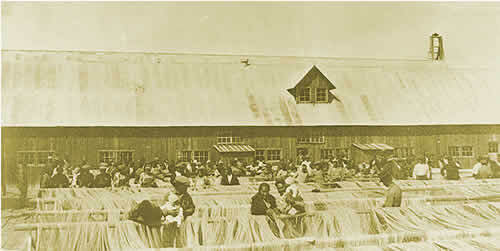 BYN built a shipyard in Whitehorse and a repair yard in Dawson City. 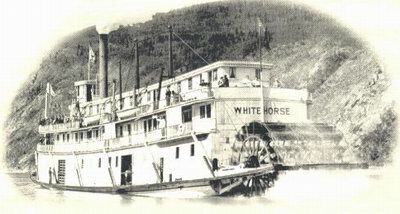 Among the first vessels built was the Whitehorse, seen above, the “old grey mare” which served for 53 years – the longest continuous service of any vessel on the Yukon River. As the primary means of transportation and communication in the Yukon for the first part of this century, the paddle-wheeler was an integral part of the life of Yukon people. When the last of the boats were pulled from the river in 1955, a way of life ended. 1900 Skagway census; Canadian Navy website; Minter fonds at Yukon Archives. George Washington Dillon was born in 1856 in Iowa. He came to Alaska in 1880 from Butte Montana and Washington State. He possibly was the U.S. Marshal in Skagway and also a councilman. The 1900 census lists him as a hunter. He became the Superintendent of Skagway Light & Power Company and manager of the Skagway Wood Yard. He was also a gambler and the street commissioner and dabbled in real estate in 1915. 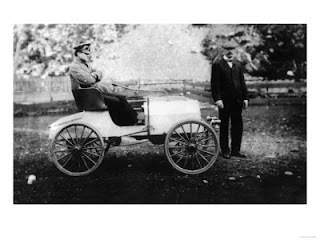 In 1905 when Robert Sheldon was working for the Skagway Light & Power Company he built the first car in Alaska. The picture above was taken of that car with two important men on it. Robert was only 21 years old at the time, so he is not one of the two. So one of the other two might have been the Supt Dillon. When George’s great grandson came to Skagway in June 2009 he stated that Dillon died by freezing to death on the streets of Skagway on this day, October 26, 1922 at the age of 66. G.W. 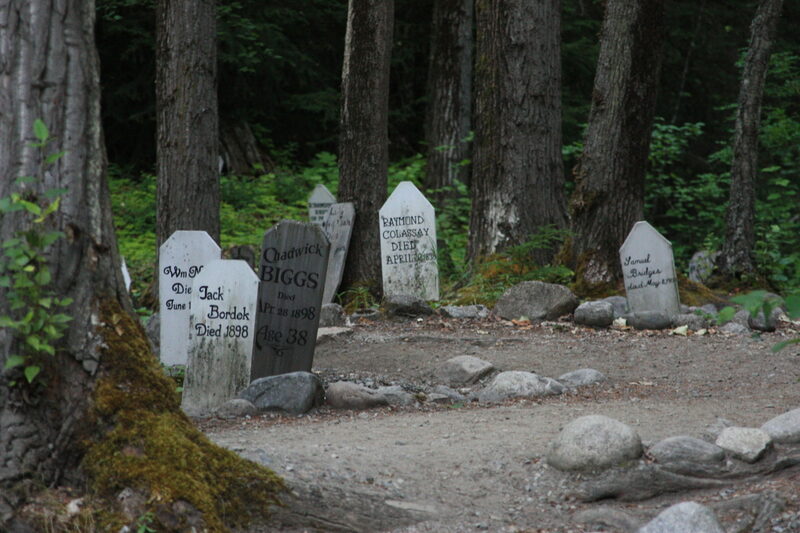 Dillon is buried in the Skagway Pioneer Cemetery in the upper section next to his wife Isabella who died in 1909. When she died she left a newborn daughter and 6 other children aged 6 through 18. 1900 1910 and 1920 censuses; 1902,1905,and 1915 directories; Skagway death record; great grandson. Adolph Gustav Arlitt was born August 27, 1865 in Waldenburg, province Schlesien, Germany. He was a baker and immigrated in the 1880’s, settling first in Austin, Texas, where he worked at the Lundberg Bakery. In 1888, he moved to Seattle and was employed at a number of bakeries including A.W. Piper Bakery, Queen City and Eureka Baking Company, and the O.H. Thrall Bakery. In 1897, he and his friend, Fred Olshewsky opened The German Bakery & Restaurant in Skagway. Gus returned to Seattle in the spring of 1900 to be with his family, while Olshewsky stayed on in Skagway for about another year. 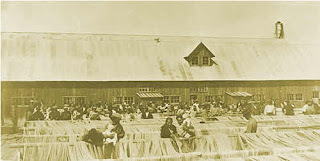 Gustav remained in the bakery business in Sumas, Sehome, and Olympia, Washington, where he started the German Bakery and Coffee House, and later, Arlitt’s Bakery. In 1921, he became one of the original 125 investors in The Olympia Veneer Company, and worked there mixing glue for the plywood until 1935. He died on August 3, 1937 and is buried in the Masonic Cemetery in Tumwater, Washington. Hattie Maria Corrin was born in South Coventry, Connecticut on this day, October 23, 1864. She was educated in private schools and enjoyed a comfortable existence until the business recession of 1877 and the death of her father a few years later drastically affected the family’s fortunes. The family moved in with relatives and Hattie contributed to their support by giving piano lessons. She was married in 1888 to Lester B. Lockwood and moved with him to Tacoma in what was then the Territory of Washington. Her only child, Lester Corrin, was born there in 1892. In 1897 the marriage failed and she found herself alone with very limited financial resources and a young son to support. The Alaska Gold Rush was in full swing and in casting about for some means of supporting herself and her son, she and a friend, a professional nurse, decided to establish a combination hospital-hotel in Skagway for sick and injured miners. The two women pooled their resources to purchase building materials and medical supplies. En route to Alaska they were shipwrecked in a blizzard outside Skagway, losing all their provisions and barely escaping with their lives. She supported herself for about three years in Skagway in a variety of jobs, including nurse, assistant to a physician and steamship ticket agent, until the rigors of the life in Skagway affected her health. She returned to Tacoma, where she found employment as the supervisor of a mens’ club. Further decline in her health forced her to move to a milder climate and she used the small savings she had accumulated for her son’s education to move to southern California. While convalescing in California, she met and in 1905 married Henry Alvah Strong, co-founder and first president of what is now the Eastman Kodak Company. Mr. Strong, a widower twenty-five years her senior, legally adopted her son and the marriage was an unusually happy one until Mr. Strong’s death in 1919. Having made the transition from a life of struggle and hardship to one of considerable luxury, Mrs. Strong dedicated the remainder of her life to helping others less fortunate than herself. The list of her charitable activities and honors is far too lengthy to include here but includes the establishment in 1927 of a retreat near Paris for face-wounded veterans of the French Army (for which she received the Legion of Honor), the establishment of the Hattie M. Strong Foundation in 1928, and gifts of various buildings to hospitals, educational institutions and social service agencies in the United States, Europe, Asia and Africa. Today there is a Hattie Strong scholarship given to students in their final year of study for a Baccalaureate or Graduate degree. This and similar stories of heroes and heroines of the Gold Rush make me wonder: were they heroes before they came up to Skagway or did Skagway and the experience here make them see the world for the challenges and possibilities? Certainly in Hattie’s case we see a woman who pitched and and made a difference in the world. Hats off to Hattie! Hattie M. Strong Foundation site. 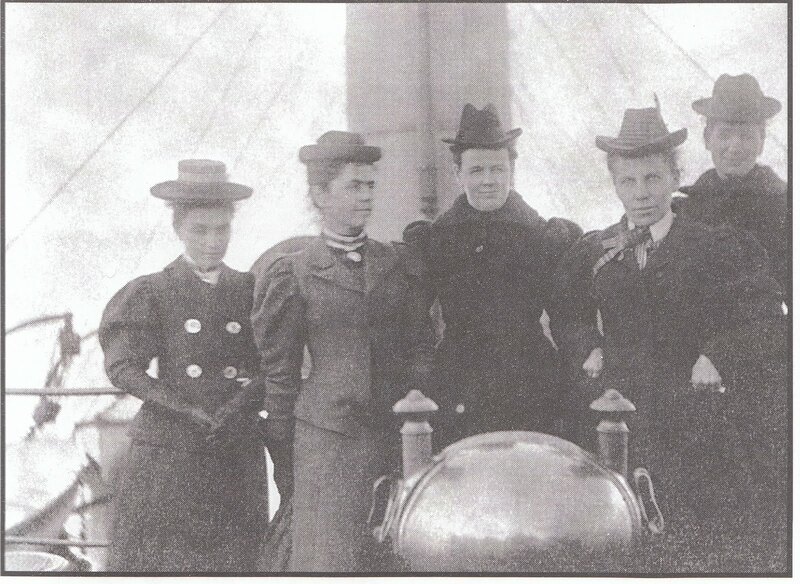 One interesting story of the Klondyke is the expedition of four nurses from Ottawa. The Victoria Order of Nurses was started by Lady Ishbel Aberdeen, wife of the Governor General in Ottawa. She was heavily involved in the launching and further development of the VON for Canada. Lady Aberdeen had read with interest an appeal from Rev. Robert Dickey of Skagway, Alaska, in the Presbyterian periodical, The Westminster, calling for trained nurses to go to the Klondike. She sent Margaret Payson, Amy Scott, Georgia Powell and Rachel Hanna to Dawson. They were outfitted in “neat brown duck suits with bloomers and hobnail boots”. On May 14, 1898, two hundred men, six women and 60 tons of supplies embarked on the Islander for the Klondyke. They got off at Wrangell and went up the Stikine River the Cassiar Mountains and Fort Selkirk to Dawson. They were accompanied by Mrs. Cortlandt Starnes and Faith Fenton, a reporter. Their work in Dawson and elsewhere is indescribable. Amy and Goergia left in 1900 and went to Africa to help in the Boer War, although Georgia returned to Dawson and married a mountie. Margaret stayed in Dawson and married a wealthy miner. Rachel also stayed on and then went to Atlin for 14 years. 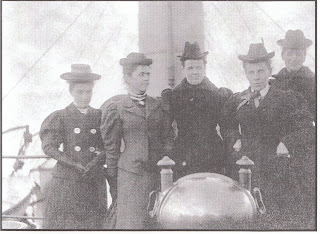 The picture above shows 5 women onboard the ship in 1898. Faith Fenton is definitely the second from the right as I have several other photos of her that match. The Right Way On by Olive; The Story of Klondike Nurses online.